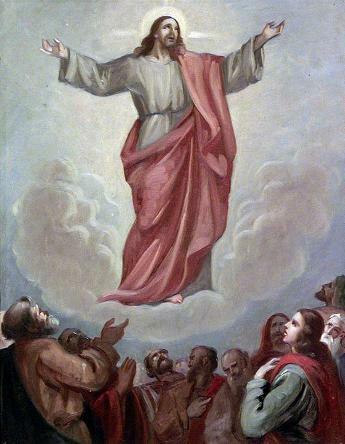 The Ascension is certainly a mystery as Pope Francis recently observed in one of his catecheses on the Creed. "Jesus’ Ascension took place concretely on the Mount of Olives, close to the place where he withdrew in prayer before the Passion to remain in profound union with the Father: once again we see that prayer gives us the grace to live faithful to God’s plan. At the end of his Gospel, Saint Luke recounts the event of the Ascension in a very synthetic way. Jesus leads his disciples “out as far as Bethany, and lifting up his hands he blessed them. While he blessed them, he parted from them, and was carried up into heaven. They worshipped him, and returned to Jerusalem with great joy, and were continually in the temple blessing God” (Luke 24:50-53). So says Saint Luke. I would like to note two elements of the account. A second element: Saint Luke says that the Apostles, after seeing Jesus go up to Heaven, returned to Jerusalem “with great joy.” This seems somewhat strange to us. In general, when we are separated from our relatives, our friends, for a definitive departure and above all because of death, there is a natural sadness in us, because we will no longer see their face, we will no longer hear their voice, we will no longer be able to enjoy their affection, their presence. Instead, the evangelist stresses the profound joy of the Apostles. But how is this possible? Precisely because, with the look of faith, they understood that, although removed from their eyes, Jesus always stays with them, He does not abandon them and, in the glory of the Father, He sustains them, guides them and intercedes for them"
"It is not for you to know the times or seasons that the Father has established by his own authority. But you will receive power when the holy Spirit comes upon you, and you will be my witnesses in Jerusalem, throughout Judea and Samaria, and to the ends of the earth." "Jesus Christ, the one priest of the new and eternal Covenant, "entered, not into a sanctuary made by human hands. . . but into heaven itself, now to appear in the presence of God on our behalf." There Christ permanently exercises his priesthood, for he "always lives to make intercession" for "those who draw near to God through him". As "high priest of the good things to come" he is the centre and the principal actor of the liturgy that honours the Father in heaven. 663 Henceforth Christ is seated at the right hand of the Father: "By 'the Father's right hand' we understand the glory and honour of divinity, where he who exists as Son of God before all ages, indeed as God, of one being with the Father, is seated bodily after he became incarnate and his flesh was glorified." 664 Being seated at the Father's right hand signifies the inauguration of the Messiah's kingdom, the fulfilment of the prophet Daniel's vision concerning the Son of man: "To him was given dominion and glory and kingdom, that all peoples, nations, and languages should serve him; his dominion is an everlasting dominion, which shall not pass away, and his kingdom one that shall not be destroyed." After this event the apostles became witnesses of the "kingdom [that] will have no end"